The coastal redwood (Sequoia sempervirens) is one of the most magnificent trees. 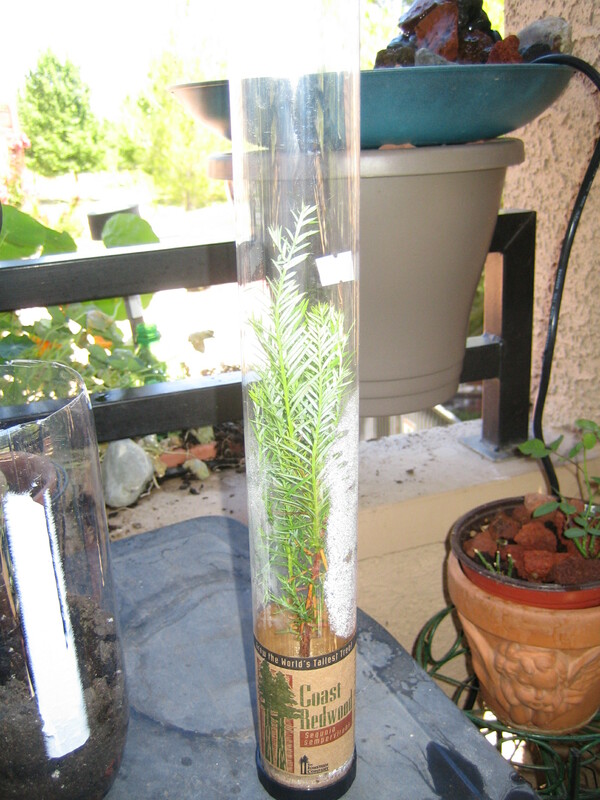 It has the potential to grow into the tallest tree in the world. This tree is also called California Redwood and Giant Redwood. This tree is on the endangered list, and has a limited range in which it is still growing natively. I found it interesting that the temperate rainforest that was the original home of this tree is said to have stretched from coast to coast here in the US. Climate changes as well as other changes in the land has diminished this forest to a small part of California. There are nursery’s here in California that grow seedlings of this great tree. There is also a website that I found once, and seem to not be able to find again, that had pictures of these trees around the world. Places people have brought these trees to plant in the ground, or even as a potted plant. I have been gifted with a sapling. Due to the fact I am in such a small space, and do not have a 1-5 gallon pot available now, I have potted it temporarily in a 2 liter bottle. This tree is something I feel would look good in any garden. In a pot, of if you have the luck of space, planted in the ground. I am hoping this year I can make the gift of this tree to family members. There are websites that allow you to order this tree. If you have the space for a 5 gallon pot in your home, deck, porch, yard, please order one of these gentle giants, and try your hand at preventing it from disappearing forever. My temporary ‘pot’ was quickly out grown. I was given this lovely pot to replant the seedling in. It is looking great on my deck.